As sweet as cinnamon: A few delights in the mail and a delightful visit. A few delights in the mail and a delightful visit. It was such a lovely present with some wonderful goodies for me. A gorgeous brooch that Fee made... a sweet memory book for secret memories. only eyeing off only the night before... I so want to simplify my life. Declutter the things that I so don't need anymore. This will be a great read in the coming holidays. 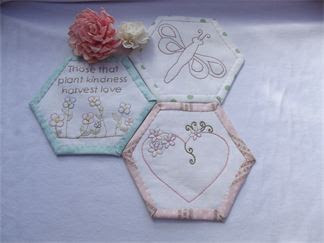 And a pattern for these delightful hexi's ...so shabby yummy. It's going to be fabulous...I can't wait till next month. Thanks Fee I just Love my pressies. another belated Birthday gift...we had been meaning to catch up for ages. A cup of tea and a chat...sweet fellowship. It makes for lovely surprises. Two little books, one of Promises and Mini Tea Times...yes please. and a fridge magnet. Thanks Julie. Lots of lovely presents here. Fee is so lovely and so are her hexies -I'm stitching them too. Lucky girl with some great gifts and you surely finished those hexies in a hurry.